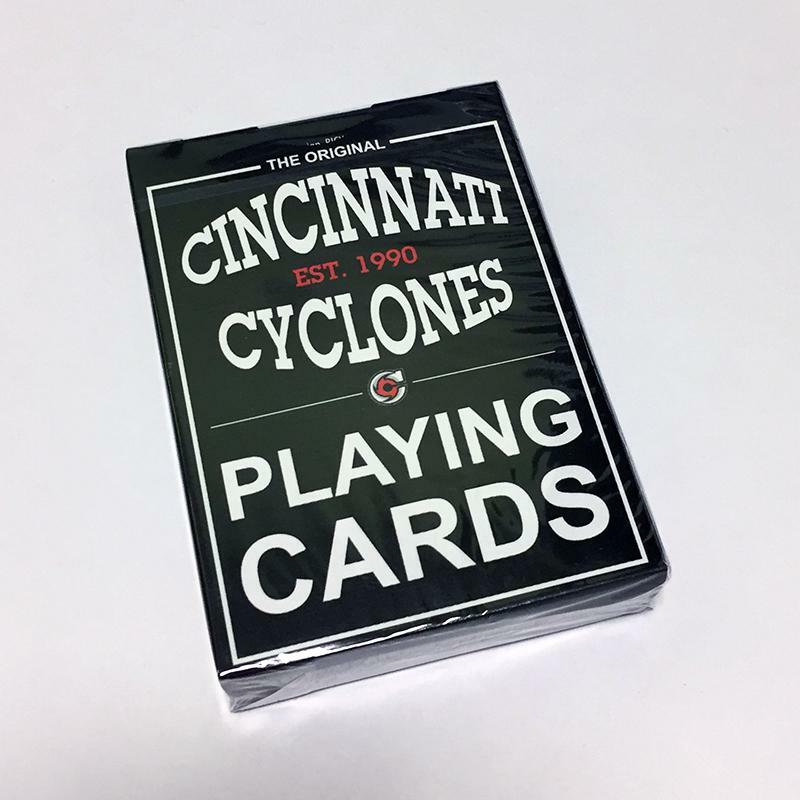 For Immediate Release: April 17, 2019 Kelly Cup Playoffs – Divisional Semifinals Game 3 vs.
For Immediate Release: April 13, 2019 CYCLONES FALL IN GAME 2 OF OPENING ROUND Cincinnati Suffers First Shutout of Campaign Cincinnati, OH- The Cincinnati Cyclones fell to the Kalamazoo Wings, 2-0, in Game2 of the Central Division Semifinals of the 2019 Kelly Cup Playoffs presented by Smile Direct Club. 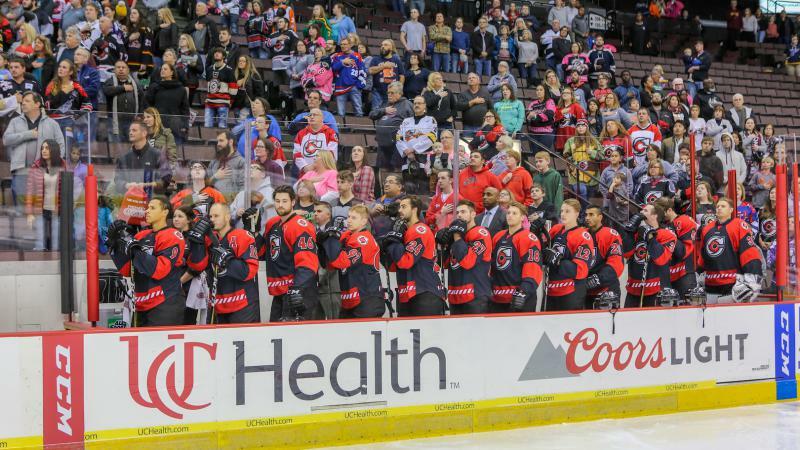 For Immediate Release: April 13, 2019 Kelly Cup Playoffs – Divisional Semifinals Game 2 vs.
For Immediate Release: April 12, 2019 CYCLONES TAKE PLAYOFF OPENER AGAINST KALAMAZOO Seven Different Players Score Goals in Game 1 Cincinnati, OH- The Cincinnati Cyclones defeated the Kalamazoo Wings, 7-4, in Game 1 of the Central Division Semifinals of the 2019 Kelly Cup Playoffs presented by Smile Direct Club. 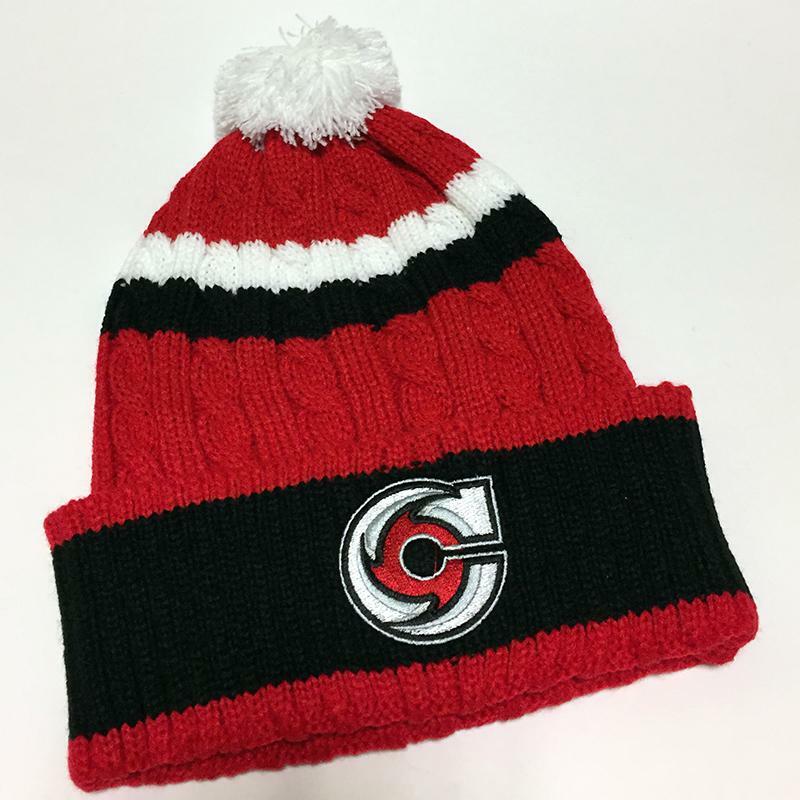 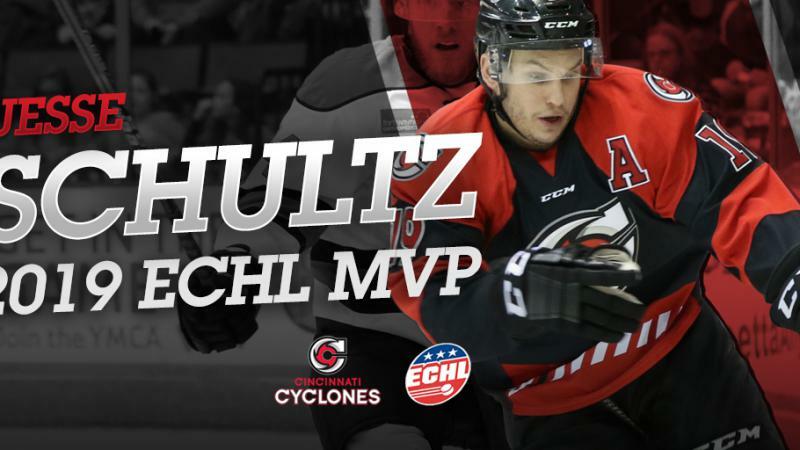 For Immediate Release: April 12, 2019 Kelly Cup Playoffs – Divisional Semifinals Game 1 vs.
For Immediate Release: April 12, 2019 SCHULTZ NAMED CCM ECHL MOST VALUABLE PLAYER League Scoring Champ Set ECHL Career Highs in Points, Assists Cincinnati, OH- The Cincinnati Cyclones, in conjunction with the ECHL, have announced that Cyclones forward Jesse Schultz has been named the 2018-19 CCM ECHL Most Valuable Player. 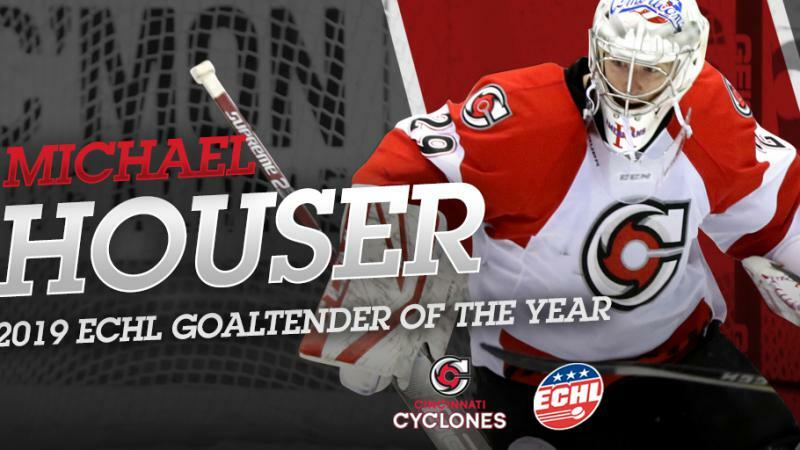 For Immediate Release: April 11, 2019 HOUSER NAMED WARRIOR HOCKEY ECHL GOALTENDER OF THE YEAR Netminder Led the League with 29 Wins Cincinnati, OH- The Cincinnati Cyclones, in conjunction with the ECHL, have announced that Cyclones goaltender Michael Houser has been named Warrior Hockey ECHL Goaltender of the Year. 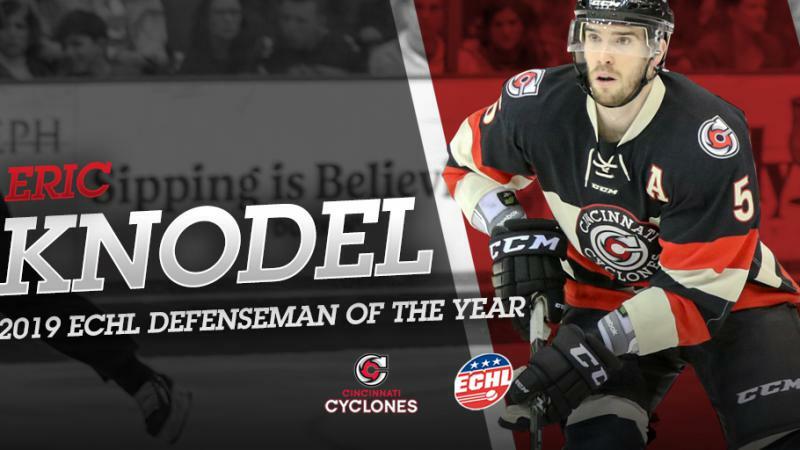 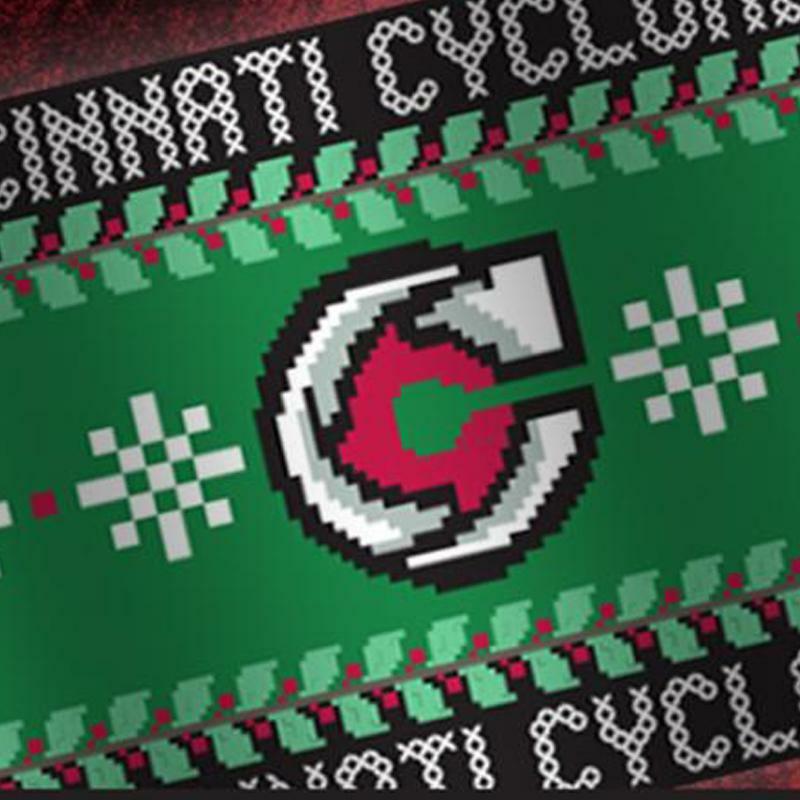 For Immediate Release: April 10, 2019 KNODEL NAMED CCM ECHL DEFENSEMAN OF THE YEAR Rearguard Takes Home Second Honor of Postseason Cincinnati, OH- The Cincinnati Cyclones, in conjunction with the ECHL, have announced that Cyclones defenseman Eric Knodel has been named the 2018-19 CCM ECHL Defenseman of the Year. 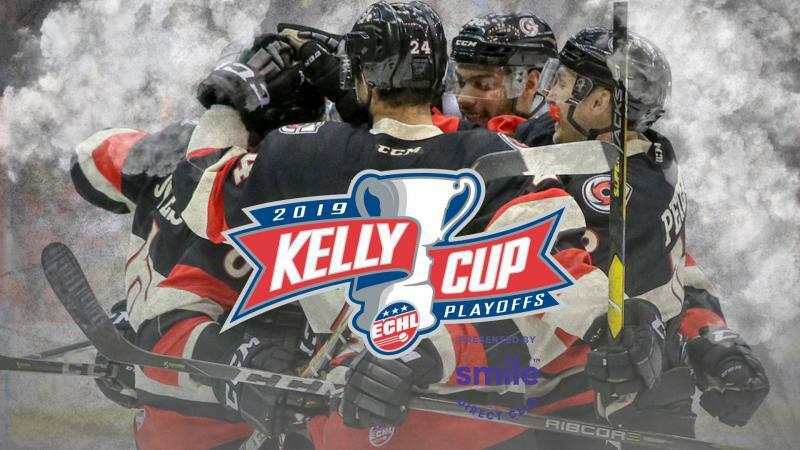 For Immediate Release: April 10, 2019 CYCLONES ANNOUNCE PLAYOFF ROSTER Cincinnati to Begin Kelly Cup Playoff Run Friday at Home Against Kalamazoo Cincinnati, OH- The Cincinnati Cyclones have announced their roster for the 2019 Kelly Cup Playoffs presented by Smile Direct Club. 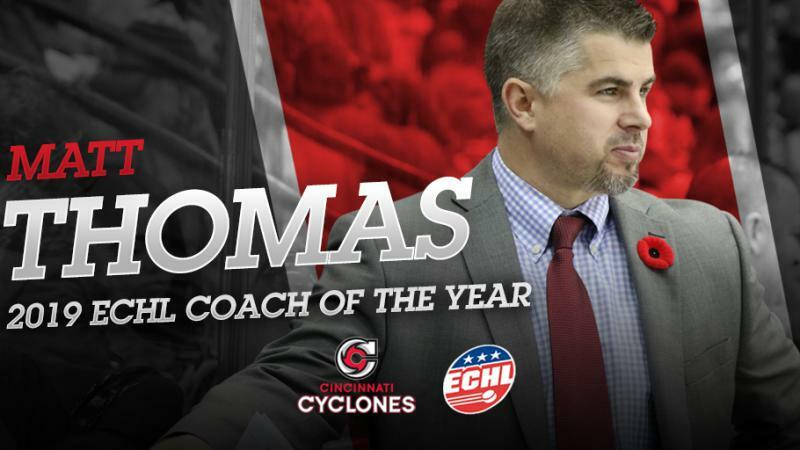 For Immediate Release: April 9, 2019 THOMAS NAMED ECHL COACH OF THE YEAR First-Year Bench Boss Led Team To Brabham Cup Cincinnati, OH- The Cincinnati Cyclones, in conjunction with the ECHL, have announced that Cyclones head coach Matt Thomas has been named the recipient of the John Brophy Award as ECHL Coach of the Year.